Erica Perez and John Beaver outside their new shop. Oakland's most beloved specialty spice shop recently opened a second location in Albany. The new Oaktown Spice Shop (1224 Solano Ave.) is a roomy 1,000 square feet, featuring custom shelving, worktables, and a counter built from reclaimed wood. Apothecary-style glass jars are filled with fresh spices so you can buy the exact amount that you need. 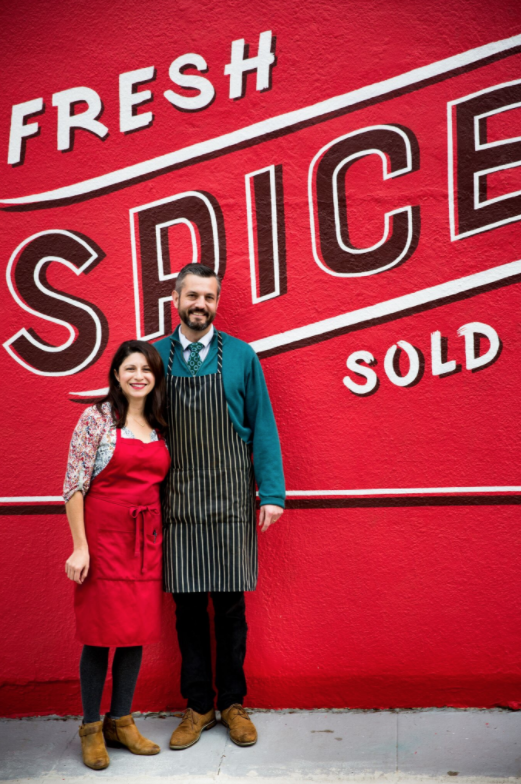 As with the original Oaktown Spice Shop, the new location features custom spice blends and knowledgable staff. To celebrate, owners John Beaver and Erica Perez are hosting a grand opening party on Sunday, Dec. 10, from 2 to 6 p.m. with snacks, mulled cider, and bubbly.